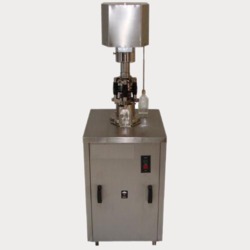 The semi automatic cap sealing machine is precision built on sturdy welded MS frame completely enclose in stainless steel sheet and doors are provided to facilitate the servicing of machine. Machine is having motorized rotating head mechanism, which ensures proper cap sealing with uniform torque. Require manually feeding & unloading container, where the body and the neck of the container are positioned below the rotating head and sealing head is performing perfect operation of capping with uniform torque.